Almond Breeding: Lottery or System? A lot has been written about Stippers, Almond, Multicolored, Sprinkles and the related colors, although the genetic basis and the appearance is known for long. However, a recapitulation is useful because new fanciers get interested in the color and knowledge and understanding of literature differ. In this illustration some pictures from the net had to be used to show which terms are used in the fancy in specific sections. Stipper is the generic term and not in contrast to the other terms describing sub-groups. All these colors show darker 'flecks', spots, or sprinkles, as always the darker patches on brighter grounds may be called. 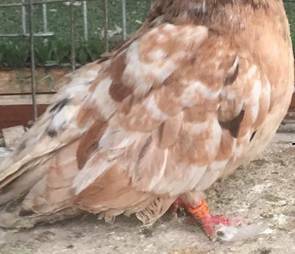 In the German pigeon standard Almond as a color is only found for English Short Faced Tumblers and as Brown- and Yellow-Stipper with similar requirements for Danish Tumblers. Some Oriental Rollers are very similar. The body base color is almond, that means brown-yellow. On that base black sprinkles appear. Primaries and tail feathers in English Short Faced Tumblers should be three-colored with the colors almond, black and white with distinct boundaries of the color areas of each other. In that point the requirements for Danish Tumblers are more moderate. Genetically, almond-colored pigeons are always heterozygous for the Stipperfaktor (St) as it is called in Danish Stippers. Homozygous St // St are white of color and have vitality problems. Therefore, two Almonds are not mated together, but Almonds are matched with the complementary colors Kite and Agate. Kites are dark black-brown with bronze luster. This is the color of the red milan or 'kite'. Agates are intensely colored recessive red, which get in the shield area and occasionally in the head area with the molt white feathers. Golden dun and yellow agate are dilute kites or agates. The color DeRoy is not only unique because of its peculiar spelling, but also because it has the stipple factor like Almond. DeRoy is colored between red and yellow (cord-duroy). The wings are slightly brighter, similar to a fink marking. Dark mahogany sprinkles often appear in the body's plumage. As far as pictures or reliable descriptions from the past are present, DeRoy were self and without white in the shield. The genetic code of DeRoy was only found in the 1930s by Christie and Wriedt. Before this, they were partially thrown together with Agates. This explains a part of the incorrect statements on heredity in the old literature. Red and yellow agates are not pieds, although they show a color-white contrast after the molt. They leave the nest in a single color and then get more or less white feathers in the shield, which can lead to white shields. Primaries and tail remain colored. In some exceptional cases they remain self, which - if they come from Almond strains - does not diminish their breeding value. This white factor is only shown in Recessive Red and thus in Agates. It is not applied to color-classes with a black base color like Kites and Golddun. These show no white in pure strains. Kites and Golddun as well as Almonds, and in the author's experience DeRoy from pure streams, show no white in the shield. Today's DeRoy with white in the shield in the author's opinion carry pied or tiger traits from mating with non almond-related colors. These are factors which lead to tigers in blacks and self reds and yellows in other breeds. Mating of other colors in Almond strains may contribute to vitality. However, as a result, some individuals will no longer be pure for factors such as 'kite', dark checks, etc. The proportion of well-colored Almonds will be lower than before that mating. The proportion is still not high in couples of Almonds with the complementary colors. It varies in the mating of Almond x complementary color between 25% and 50%. If an almond is mated with a kite and both partners are heterozygous for recessive red, then they will be 6/16 or 37.5%. 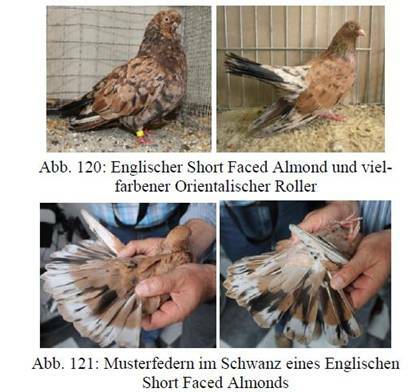 Years ago, a breeder of Oriental Rollers, a breed in which some breeders also strive for almond coloring, wrote that he successfully introduced blue Oriental Rollers into the Almonds. In the first generation and with a mating back to the Almond strain, adverse consequences are not necessarily to be expected. In the first generation, the offspring are all heterozygous, and in the case of the mating back to Almonds partly heterozygous for genes that are responsible for the correct almond color, e.g. dark check and the bronze factor kite. If, in unfortunate cases, two such individuals are mated together in later generations, then the above-mentioned percentage will be pushed from 37.5 to 21% in otherwise similar conditions. If jokesters then in addition cross with pieds and grizzles, and introduce rosewings and shield tigers, then the Almond breed becomes really a lottery with low prospects. Also in English Short Faced recently new colors like Andalusian and Indigo, Reduced, Dominant Opal and others came to its own. Also self black and white and mottled varieties were shown. Fair black 'mottles', as the rosewings (some white feathers on the shoulders in form of a rose and a V-shaped white handkerchief back) in England were called, have not been shown so far. These were very rare at the time of Fulton in the 1870s, who extensively discussed them. They were made from black tigers, which are today recognized by the Dutch high-flyers alongside the rosewings as a shield tiger and represent a precursor to white shields. In ignorance of the genetics, black with white in the shield at that time was designated as 'black agates'. Fanciers at that time could not know that the trait responsible for the white of the red and yellow agates is a completely different factor or combination of factors. The term 'agate' may nostalgically have a positive connotation. Genetically, it was already not correct at that time and it is not today. 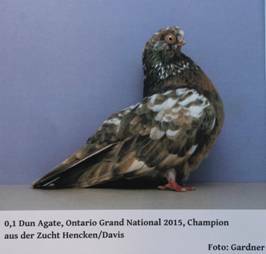 The designation 'agate' was still used by breeders and at the 'Grand National' 2015 in Ontario 2015 a 'Dun Agate' was even championed. The term pretends that it is the same factor as Agates in red and yellow Agates. It can lead beginners and genetically uninformed breeders to the thoughtless crossing, by which undesirably traits for breeding Almonds may be transferred as seems to have happened in a young almond shown by a fancier in the net. Now unfortunately there are hardly any beginners in Almond breeding. One should, however, not make the few who are there, the introduction and an understanding of the relationship of the colors to each other unnecessarily difficult. Unfortunately many pigeon breeders have little knowledge about genetics. Anyone who invests a morning with a good textbook to study the basics with the instrument of the Punnett's square will understand quickly the basic concept. Then it is easy to follow what we get from the mating of Almonds with the complementary colors like that in Fig. 2. One benefit of this 'investment' would be that the instruments internalized can also be applied to other phenomena.